Denis Shapovalov is a talented next generation player from Canada who jumped into fame for the wrong reason yesterday during the Great Britain vs Canada Davis Cup match, when he bashed a ball at an umpire. It wasn’t intentional but a good example what can happen when anger gets the better of you on the tennis court (and elsewhere). Canada was defaulted and Shapovalov learned a harsh lesson. Let’s hope the 17-year-old finds other, less destructive ways, of coping with his frustration. One way of doing it, made popular by players such as Benoit Paire and Marcos Baghdatis (see some excellent racquet smashes here), is smashing your tennis racquet. But what racquet would Shapovalov break if he did? 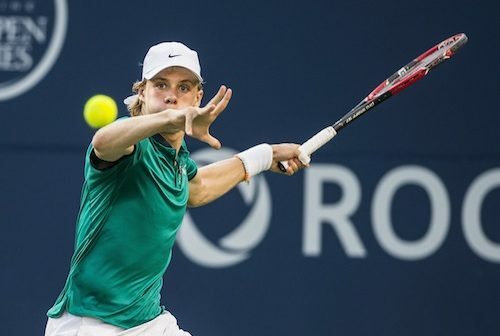 Shapovalov endorses the Wilson Pro Staff 97 , but there is the recently reissued Wilson Six One 95 underneath the paint, still one of the most popular racquets on the ATP Tour! And you who have tried the Wilson Six One 95, knows why. It’s simply a great racquet for a wide group of players. I’m not a hundred percent sure, but I think Shapovalov uses a hybrid string such as Federer‘s Wilson Champion’s Choice consisting of Natural Gut in the mains and Luxilon Alu Power in the crosses. For you who are curious about the horrible ball smashing incident, I’ve posted it below. Gotta feel for the umpire here. I hope everyone, including me, finds a way to dial down on the on-court-aggression. It’s just a sport. A beautiful sport, but a sport nonetheless. Tags: Denis Shapalov gearDenis Shapalov Tennis RacquetDenis Shapovalov gearDenis Shapovalov Tennis RacquetShapalov anger outburstShapalov CanadaShapalov racquetShapalov tennisShapalov umpireShapalov's racquetShapovalov anger outburstShapovalov racquetShapovalov's racquetwhat tennis racquet does Shapalov use?what tennis racquet does Shapovalov use?